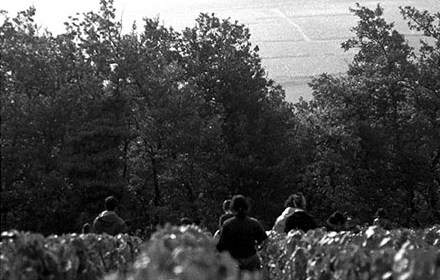 A photo diary: the passing days of a grape harvest in rural France. 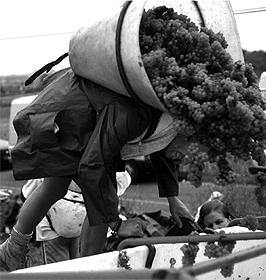 These photos chronicle 12 days of harvest at the vineyards of Aubert & Pamela de Villaine in the village of Bouzeron in the Côte Chalonnaise. The harvest usually begins in late September, the date coming more or less one hundred days after the flowering of the vines in the early summer. For the harvester, the workday begins at 7:45am and ends around 6:00pm. The days are spent working in teams up rows of vines one plot after the next. The mornings are cold and the afternoons are often warm. In the trucks that carry the workers to the vines lies a pile discarded sweaters and coats. The anticipation of the lunch break and dinner is fueled by occasional bottles of the wine and water passing between the vines. Before lunch, we wash the mud from our clothes with a garden hose. Lunch invariably includes a meat stew, wine, cheese and fruit. Conditions when the foreman is most eager to get back to work: impending storms, late starts, troubles with the tractors. It matters to have good rubber gloves, good clippers and interesting co-workers. Although each day is long, one falls into the next. In a routine of working between the vines buried in one's thoughts, rising up to see the wide vistas, stopping for conversations, water or wine, or sharing songs and words between the grape leaves, the fortnight can begin to seem like a single long day. The day is punctuated by highs and lows, shifting moods, and changing weather. At the moment he announces the harvest,the winemaker is gambling with nature. Bring forty harvesters to your property too early, you pay for them to sit about; if they come too late, you might lose the harvest to rain or hail. The problem is complicated by growing three different varieties  Chardonnay, Pinot Noir, and Aligoté  which ripen at different times. Hail in the next village is ominous: for winemakers just over the crest of the hill, the hail has caused the loss of a year's work. Although the Aligoté is the most important grape in this vineyard, it ripens slightly later than the other varieties that are growing. First to come in is the Chardonnay, then the Pinot Noir. The order of cutting is a question of ripeness, value and practicalities. The grapes cannot all be cut in one day. In cutting the reds, one must watch carefully to spot ripeness and rot. A sour taste will tell, but it will also pucker the mouth. One looks for the light pink or green showing through the skins. Gloves wear through quickly. Without them, the sugary moistness of the grapes helps to bring on blisters. 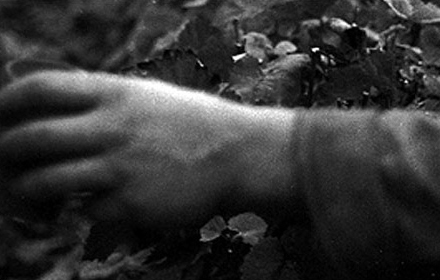 The gloves, clippers, and grapes become intimate objects  extensions of the flesh. With tough, tannin-rich skins, the grapes taste a little bitter. 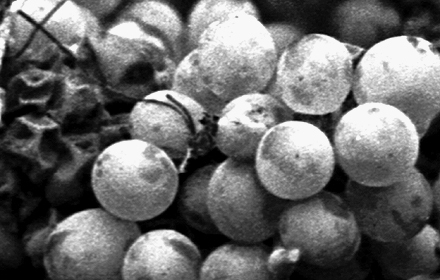 To make a good wine they must offer a balance of acids and fruit sugars. The aromas and flavors of the wine to be made exisit now only as potential. 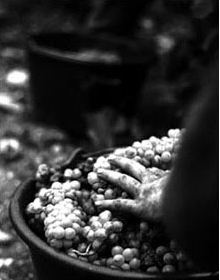 In harvest, it matters that the grapes arrive at the winery undamaged and as soon as possible after they are cut. The grapes pass from the vines to buckets, from the buckets to panniers, from the panniers to tractors, from the tractors to the winery. How much care the grapes receive at each stage is mediated by cost. 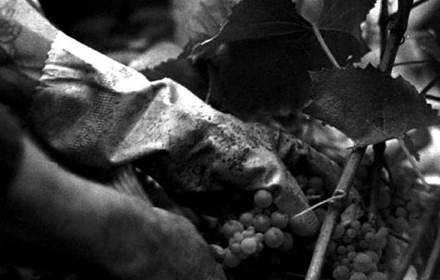 The choices are determined by the market value of the wine that the grapes of a particular terroir can produce. Tasks are assigned and repetitive. 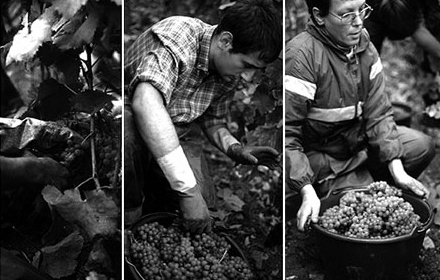 The pickers select the grapes: Red grapes should not be cut too green, or with too much leaf. Rotten grapes should be cut away. 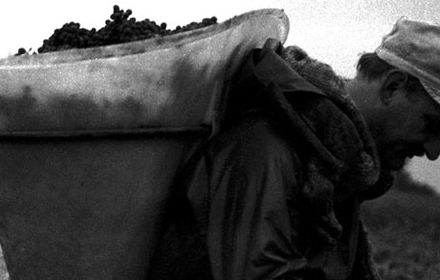 At the tractor, the foreman eyes the quality of the grapes. The porter who has carried the grapes to the tractor may return to the harvesters in his team with instructions or admonitions. Best are the tiny concentrated grapes of older vines whose roots reach far into the bedrock where they extract richer mineral content. Vines become worth harvesting after about four years and can produce good yields for fifty or sixty years  a human's lifetime. 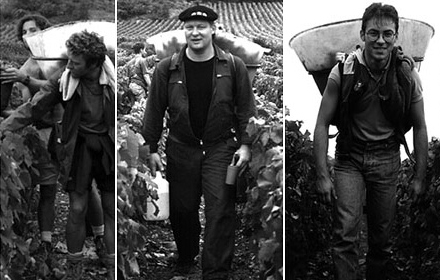 The unique quality of time felt during the harvest is set against the long history of the vines and the culture supporting them  vines are planted for lifetimes and across generations. We, too, come from various generations. There are mothers and their daughters, cousins, immigrants, returning workers, local friends, and students. 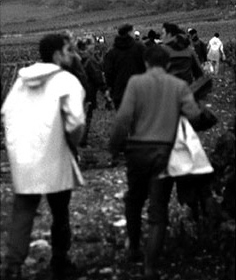 A number of local factory workers, once connected to the vineyard, join the harvest for the festive first day. A couple from Poland who met here at a harvest over a decade ago when the money mattered more, now come each year for a working holiday. At the dining table there is a kind of weary revelry. In work, there is little time to stop or reflect on the action at hand. The dining tables are in a cavernous room beneath the house and dormitories. The room is dark and comforting to eyes that have come in from hours in the sun. The space is damp and has a rich smell of the meat stews we are served. The soft, thick and crumbling stone walls fall into darkness illuminated only by the small beams of light that come from the door and small deep windows. In the vines we begin thinking of lunch ahead. In the dining hall, there is a desire to remain suspended between the memory and anticipation of the work outside. 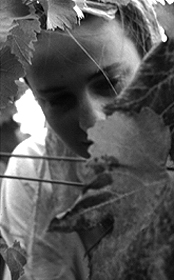 Visually, when one is working in the vines, the world seems either very near or very distant; it is a world of close-ups and landscape vistas. The presence of the fellow workers comes by way of the sounds and conversations which pass through the thicket. You feel your body in parts: your hands, your knees, or your back, and you catch the occasional glimpse of other workers in fragments through the leaves, posts, and wires. Sign posts at the edge of the town of Chagny point toward Bouzeron from the back road to Chalon-sur-Soâne. Behind the fixed labels of signs and the places and products they advertise, are the encounters of lives unfolding, visitors arriving, working, or passing through. Of the harvesters staying in the dormitory, the majority are students earning some money before the school year starts. Others are returning workers who had started coming when they were younger. Dominique, with the pannier, works on the ships that ply the English Channel. He has come to Bouzeron with his girlfriend, Dorine, who is a student teacher. Sylvie (right) studies history at a university in Lilles and this is her third year as a harvester. Bénédicte (left) is engaged to a pilot who lives in the south of France, near Marseille. After work we shower and eat in the dining hall. Some evenings are spent at the local bar or at the nearby town beer and karaoke hall. On others, we sing and talk at the winery and we take evening walks. But, some activites are also the result of unusual occurrences. This year, the celebratory drive through town that usually marks the end of the harvest has been cancelled out of respect to a neighbor whose daughter died recently in a car accident. 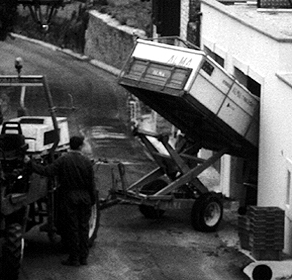 During harvest, the permanent workers at the winery manage the truck loads of grapes that arrive from the vineyards. They must stir the lees, de-stem the grapes, move the juice from vat to barrel, and prepare for each new and incoming batch of grapes. For these year-round employees, this period is the culmination of a year's work of repairing the posts and wires, pruning the vines, preparing the soils, spraying against mildew, and bottling the last year's vintage. 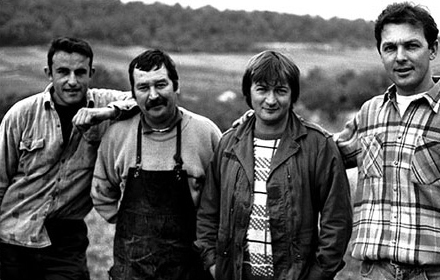 The winery team. The head of the winery lives here with his family in a house across the courtyard from Pamela and Aubert. One of the workers lives down the street. A third drives in from nearby Chagny, the fourth commutes from Chalone, a city further away. During harvest, they stay late, working while the harvesters eat. 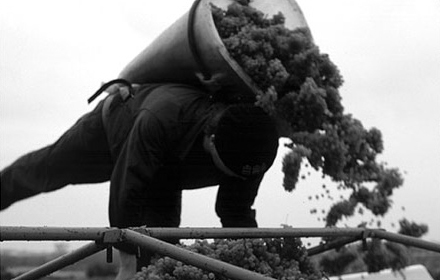 The long hours continue for several days after the harvest ends. In a good year like this, an excitement lingers as the juice begins to ferment. In the cellar, red wine is still aging from last year's harvest and will be bottled in November. Empty barrels are being filled for fermentation. The temperatures are continuously monitored for changes. You can hear the hissing sound of fermentation when it begins, and the air becomes thick and dangerous. 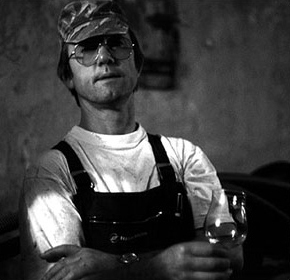 Every winemaker has a story of someone passing out from the carbon fumes and drowning in his vats. 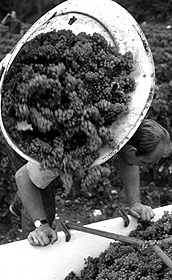 During the harvest, a neighbor, Jean-Louis, manages the teams in the vineyards while the winery staff take care of work inside. 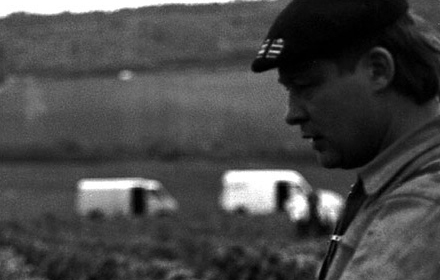 As Aubert's foreman for the harvest, his job is to be the general in the fields keeping the work moving along. In exchange, he gets to use the harvesters for a day to work his own small plot. By day he works for the telephone company, but he considers himself foremost a winemaker. 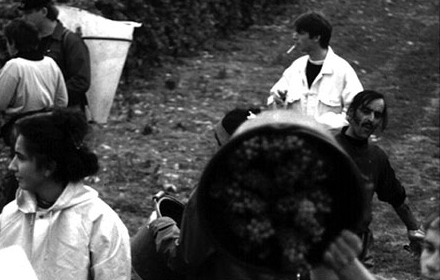 Here, and this is no longer true at all vineyards, the harvest ends with the paulée, a harvest feast and party. 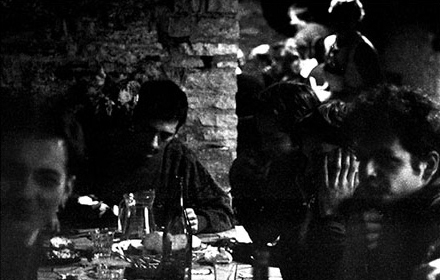 The dinner is held in the cavern beneath the main house and dormitories. It is dark room where we have spent two weeks of meals and tonight it is warmed with candle light, music, and a meal rich in meats and cheeses. The tables are arranged in a large and royal "U" with Aubert and Pamela at the head table. Aubert and Pamela make an effort to hire friends and their families through generations. The children, cousins, and nephews of past workers help construct a sense of community and a lore surrounding a low-paying work that is both miserable and memorable. 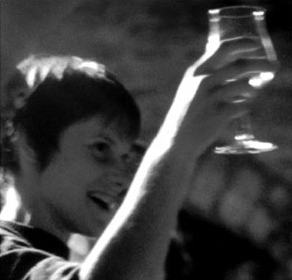 During the feast, the workers present gifts to the winemakers and the cook. 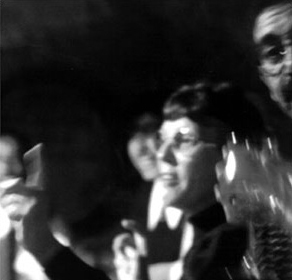 There are ritualized songs, toasts, jokes, gifts, and impromptu performances. 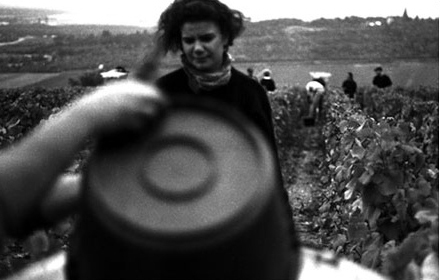 The winemakers are given a large dish, the stew-cooking chef is given a recipe book for salads. By noon tomorrow, all the harvesters will have left and an almost unfamiliar calm will return to the vineyard and village. With the goodbyes, harvesters say  until the next one. A la prochaine. The harvest now past is gathered into the memory of harvests, each with its particular conditions and its new and returning characters. Walking in the vines before harvest, the clusters have a beauty as discrete, natural objects that somehow metamorphose into the red and white juices of that other object, the bottle. In the course of the harvest, the image of the grape cluster in my mind becomes replaced by a sensual idea that married the single cluster with the truckload and the image with sticky touch and tannic taste. Like the intimacy of views from working in the vines, the grapes are both an idea and a substance. Cut, and piling up in the buckets and trucks, the grapes lose their identity as emblems of a product. 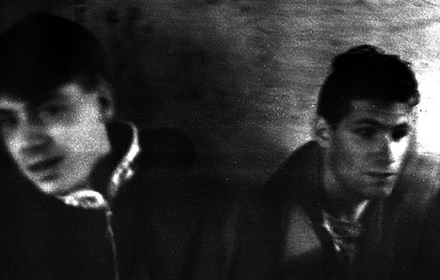 In mass, they are only a substance: stories, histories, and images revolve about them. Recognitions are a photo's proposition: a sense of peace in the vines, the urgency of a boss, the forms of faces in changing light, the halting of time as the harvesters rest and regard the view at the end of a row of vines. 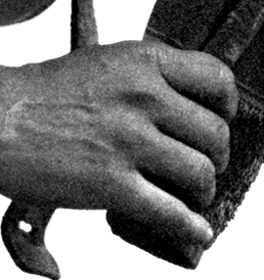 Movements are arrested, their narrative directions are like vectors  the stories are not yet determined. 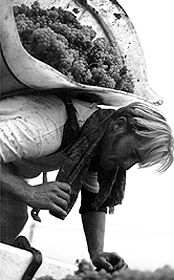 Against the (e)motion of stillness and the seeming timelessness of lunch hours in the winery caverns, I recall the immediacy of carrying a pannier full of grapes and the pressuring shouts of Jean-Louis, the harvest foreman. Shuffling these photo documents into differing orders, I find myself reinventing a series of pasts in the hindsight of narrative. Organizing the photos in a row reminds me of comic strips, of the slide strips of old viewing machines, of film storyboards, and of dream recollections where the conjunctions between images have slipped from memory. Jumping back and forth, patterns emerge of alternative stories. The focus shifts to the space between the people and the landscape views  to the enveloping world of vines, grapes, posts and soils. Angles by which I viewed people resemble others I took of objects. The histories of people differ from those of images which direct the eye to see continuities and contrasts. Such pictures describe relationships between one person and another or between people, the objects they use, and spaces they occupy. 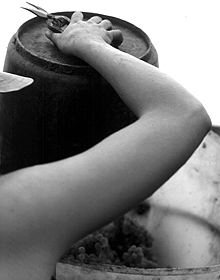 The expressions of a porter about to receive more grapes from the foreman are shaped by relationships already established between two characters, between small buckets and large ones, between the view of a landscape and imminent haul to the tractor below. 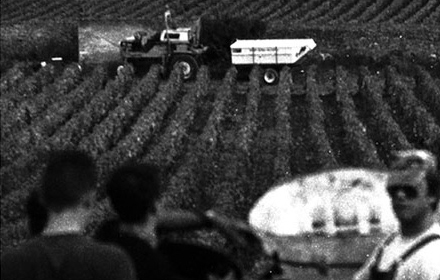 There is a sudden loneliness in the vines when all the other workers have already left  a sparse and rocky scape. 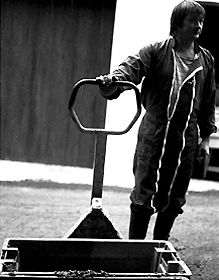 The movement away from the frame describes a descent, flattened against the ever-present tractor and the on-looking eyes of the foreman. The buckets and panniers are empty and light. The day is over, and we are heading home to the evening before us. 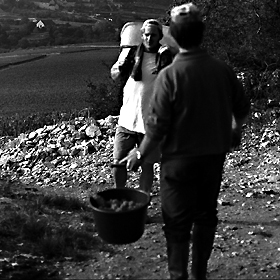 Returning to the vineyards, a memory of a day  or is it days  lingers, juxtaposed with the evening calm. Meanwhile, in the winery, the grapes are being stripped from their stems. Eventually, these will return to the soil as fertilizer. Here, briefly, another world appears with the new faces and differing tasks. desire to hold work in memory rather than anticipation. The molecules of a substantive world are now the reflective pixels of an illusory surface. New referents continue to redefine the surface qualities of images and the textures of this memory. As mirrors to a recent past, objects now in multiple fields of memory provoke reflection and reconfiguration, asking the interested viewer to turn back and revisit those moments  just images  past. 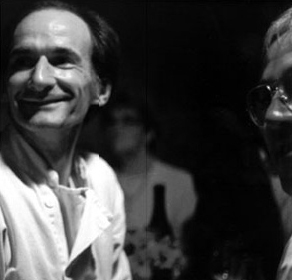 In the vines one day, Aubert de Villaine tells me that for him, "Wine is an image," by which he means, as he goes on to say, that each aspect of winemaking is part of a process of working toward an ideal form. 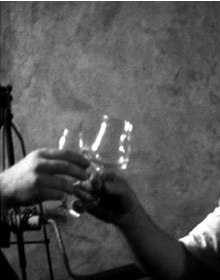 The image, he tells me, is "based on the wines that he has known in the past." His goal is to make wine in the simplest ways possible to yield a product that is pure. This "image" of the wine is a reflection of Aubert's taste, memory and knowledge of what different soils, grapes and conditions might provide.It is a reflection of cultural ideals he holds about balance, structure and elegance. As other winemakers would repeatedly tell me, a wine is a reflection of the character of the maker who has envisioned and produced it. 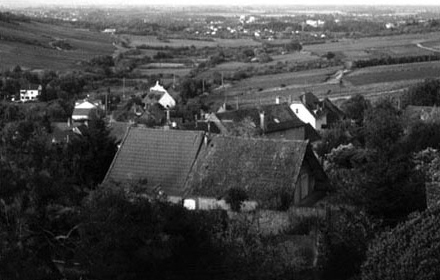 Aubert and Pamela moved to Bouzeron in 1970. Although winemaking was introduced to this valley by the church in the middle ages, the vines had been since abandonned. When Aubert and Pamela arrived there was little winemaking here. 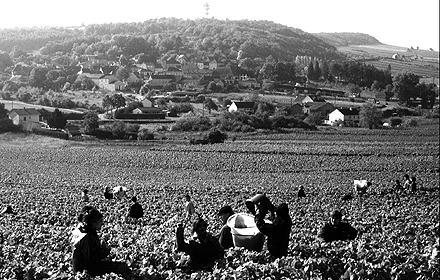 However, through research in the archives at Macon and elsewhere, Aubert discovered that the valley had a history of winemaking and was once particularly known for the white Aligoté. 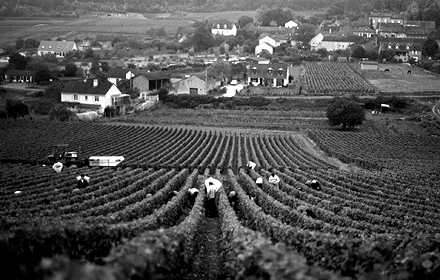 Following the deadly outbreak of phylloxera, a pest native to North America that destroyed most of the French vineyards at the end of the nineteenth century, the area around Bouzeron was, for the most part, not replanted. This was probably because the land here is less suited to the more popular Chardonnay and Pinot Noir vines that were being planted in other areas to the north on the Côte d'Or, some of which had also been previously recognized for their Aligoté production. The classification of the terroir and its wines is achieved through a system of ranking known as the Appellation dOrigine Contrôlée (AOC). The ranks include regional wine designations such as "Bourgogne Aligoté," village specific appellations, premiere growths, and grand cru. These rankings, developed in the 1930s, are based on expectations of what differing terroirs can produce. Even the greatest Aligoté is a modest wine when compared to the famous grand cru Chardonnays and Pinot Noirs of the Côte d'Or. 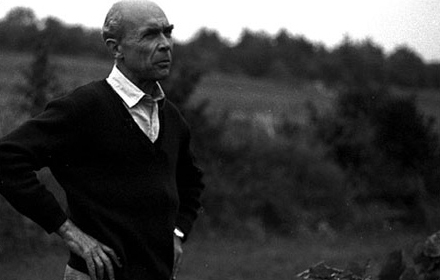 Aubert's vision of his wine is based on what he believes a terroir can yield. His role is to assist in a natural process. 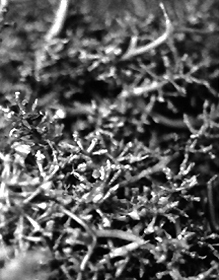 This includes moderating negative forces, such as those of frost and mildew, which can diminish the health of the vine and the positive qualities of grapes. The vision is also based on how he envisions the work and the world he builds for himself. To make wine, Aubert once remarked, you always stand before a white sheet, not knowing what nature has in store for you. In this way you are both the maker and marionette. The AOC sets requirements such as varietal percentages and minimum sugar levels such that a wine grown on grand cru soils might not obtain its grand cru status on a particularly poor year. 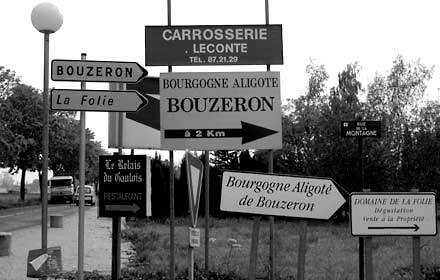 At Bouzeron, Aubert worked with the other winemakers to gain AOC village status, the only such status in France for the Aligoté. Around the village of Bouzeron the soil is particularly poor. De Villaine believes this helps intensify the flavors of the Aligoté which is a vigorous vine. At the same time the conditions are more challenging than the Côte dOrt; an ideal image of a wine co-exists with that determined by temporal, economic, or even cultural circumstances. 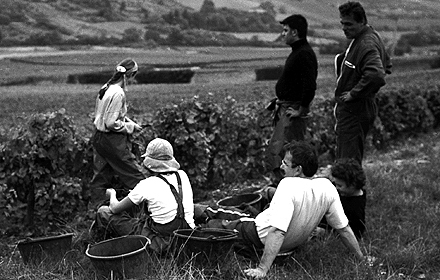 Aubert arrived in Bouzeron with extensive experience in the issues of making grand cru wine. He followed his father as a co-owner/winemaker at the famous Domaine de la Romanée Conti in Vosne-Romanée where he continues to make grand cru Pinot Noir and Chardonnay. Making a wine in the less established valley of Bouzeron presents a different set of challenges, such as a more frequent risk of frost, and less options in solving problems because the price that local wine can fetch will not support the use of expensive technologies. 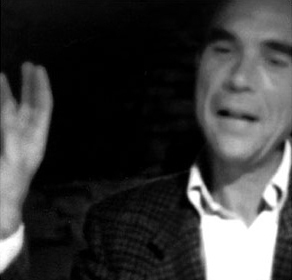 Aubert sees himself as participating in a long history of winemaking. He reads logs from past winemakers to learn about prior knowledge of the terroir and climate conditions and he writes notes of his own experiences over time. Along with developing the Bouzeron Aligoté, Aubert has been a force in promoting a regional identity for this area south of the prestigious Côte dOr under the name of the Côte Chalonnaise. Its vineyards stretch across the hills above the Soâne between Chagny and Chalon-sur-Soâne to include towns such as Givry, Mercurey, and Rully. 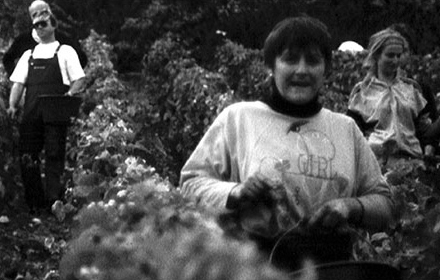 Aubert and Pamela also see it as their duty to build a sense of community, both at home and in the village. 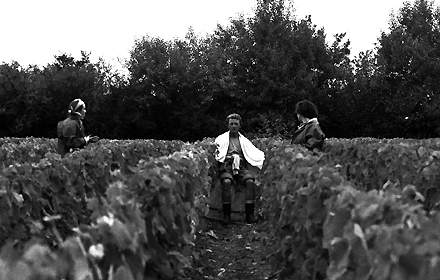 Unlike many other contemporary vineyards, for example, Aubert and Pamela continue to house about half of the fifty of so harvest workers in their vineyard dormitory. They join the harvesters for the meals in the cavernous dining hall beneath their house. 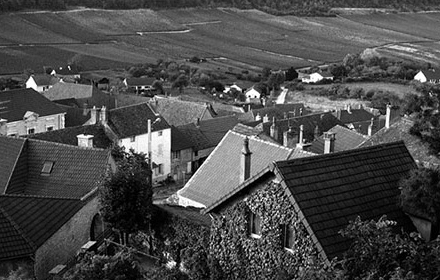 Although he commutes Vosne-Romanée to make wine at a vineyard that has been in the family for three generations, Bouzeron is his home. In the village, they actively support local events and Aubert has been occasionally asked to serve as acting mayor. 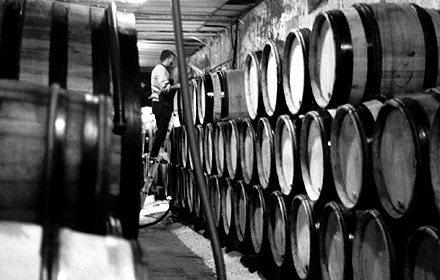 Aubert sees a certain mystery in the challenges of making a natural product that reflects the characteristics of soil and weather, and he is conscious of the strange relationship that the work has to the productlabeled and aging in a cellarthat reflects it. 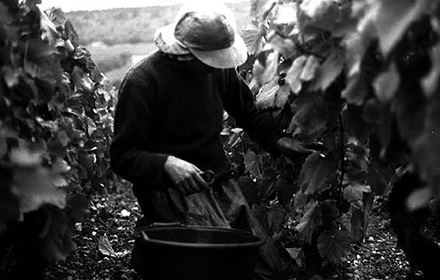 Working in the vines, I see this, too; a bottle of wine, even one passing now among the vines, seems far removed from the sticky mass of grapes in these buckets, their juices and the vine sap now aggravating the blisters on my hand. For me, taking photos is a process of learning to look. The act of presenting a place through pictures is one of linking images to some notion of the world to which they refer. In combining photos a world emerges out of fragments. Images of actuality may function as empirical records. 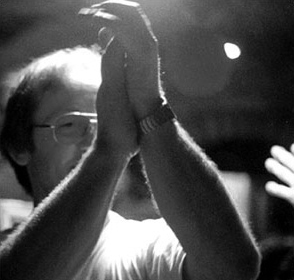 They also evoke moods that shape the experience of a moment. The sense of the whole that one uses to link the images is never complete, and the image one constructs of the world that photos refer to changes with each new picture. When juxtaposed with other images in the series, the same very images may say something else about the vineyard, work, tools, the narrative moments, or even about the plants, soil, or weather. The photographers use of framing, focus selection, focal range, subject choice, color, tone, contrast, light quality, and grain is not unlike a writers use of adjectives, adverbs, well chosen verbs, metaphors, irony or other figures of speech. These are devices that help identify specific qualities and link ideas together. 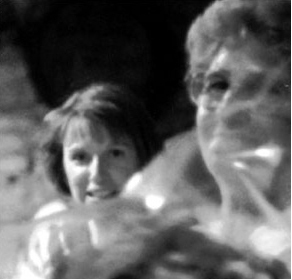 The choices of editing and working in a series may also be personally motivated; they are attempts to not have my memories subsumed into the conventions of a single snapshot. But you are not in Bouzeron, in the Côte Chalonnaise, in France, in 1996 with Dominique, Cathy, Sylvie, Thierry, Aubert, Pamela, Michel, Bénédicte, Jean-Louis.... There has been the arrival and departure of new and familiar faces, friendships, love, and rivalries, the canceled drive through town on the last day of the harvest, the dinner talks and arguments, the daytime work penetrating dreams. The lingering warm days after the harvest after leave Aubert unhappy, realizing that this year he might have waited longer and made a yet better wine. In the forty or fifty harvests of a lifetime, he remarks, one has few chances to make something truly exceptional, and he worries that an opportunity was missed. Aubert hadnt trusted a record from over a hundred years previously that advised waiting on harvesting the Aligoté in years, like this one, when cool winds blow from the north. The cool summer and fall sunshine meant that the Aligoté ripened later than the Chardonnay and Pinot Noir. Waiting might have achieved a greater sugar content and a richer wine. 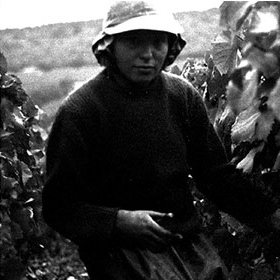 However, any change in weather and the advantage would have been more than lost and waiting adds a significant cost when harvesters who have arrived for the collection of other varieties must be kept about without work until the Aligoté is ready. 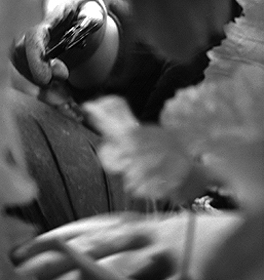 He gathers samples from the vines, clusters of grapes that were left uncut, and tests them. Although the wine that will be made from this harvest will be a good one, these remaining grapes provide an image of a potential that went unrealizedan image unfulfilled. Next time these conditions arise, he will take the risk and delay the Aligoté harvest.